5 Bedroom Semi Detached House For Sale in Basingstoke for Guide Price £575,000. This is an ideal family home with Basingstoke's Town Centre and train station a short walk away, making it ideal for commuters. 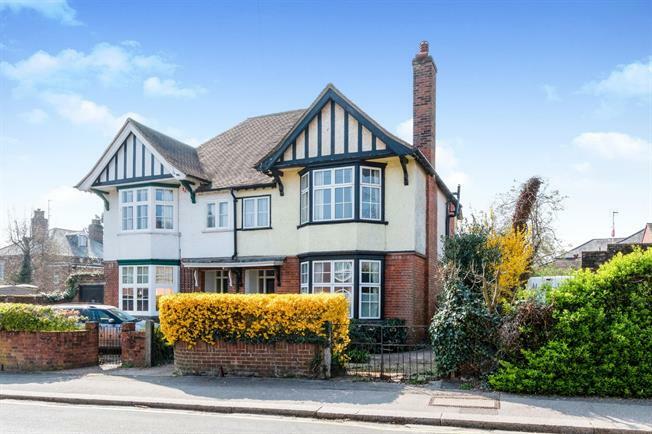 The ground floor comprises a pleasant entrance porch and hallway leading to a front facing lounge with bay window, another reception room currently serving as a study, dining room, kitchen/breakfast room, utility room and downstairs toilet. On the first floor there is a well sized master bedroom, three further bedrooms and an modern family bathroom. On the second floor, there is another double bedroom with an en-suite and ample storage in the eaves. Externally this property has a pleasant rear garden and driveway parking potential (subject to planning permission). Further benefits include original, character features maintained and gas central heating throughout.